1. Colors other than the iconic blue of the original Cinderella dress were considered, but Powell decided no color came close to the beautiful cerulean blue or cornflower blue as some call it. 2. The dress, however, is created of many layers of gossamer weight fabric, hand-painted in watercolor shades of pale blue, turquoise, lilac, lavender and white. 3. Sewn with four miles of thread, the dress seems to move effortlessly, float gracefully with every step the Princess takes. 5. 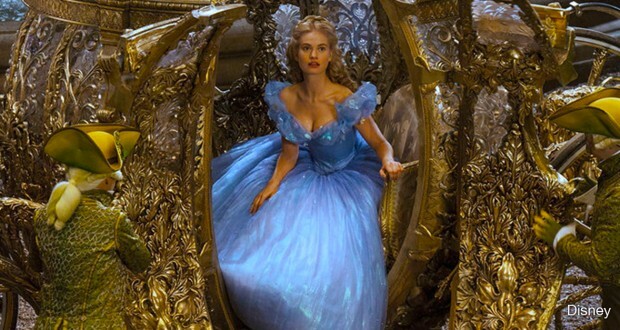 A diet of soup was the sacrifice Lily James made to corset her already tiny waist. Many breaks had to be taken during the dance to loosen the corset allowing James to breathe! Yes! This is her actual waist. 6. It took James 45 minutes to get in and out of the gown. 7. The ball gown used over 10,000 Swarovski crystals and 500 hours to complete with 20 tailors working. 8. The Cinderella Dress actually had a special unveiling in a window of Saks Fifth Avenue, NY, March 10! 9. Powell chose to create shoes with crystal since glass does not sparkle. Swarovski then designed eight pairs of shoes for the movie. 10. Lily James actually didn’t wear the glass slippers as they were not comfortable and amazingly enough… didn’t fit her foot!! 11. The Swarovski shoes as seen on Lily’s foot are created via CGI with Disney digital magic replacing the leather shoes actually worn by Lily James while filming.